The Eighth United States Army and Seoul Cyber University on Sunday held their 11th year-end joint concert at Seoul Arts Center. The annual joint concert was first organized in 2008 to share the holiday spirit with deployed soldiers and their families here, as well as to strengthen ties between the two countries. Since its inception, the year-end concert has celebrated classic Christmas repertoires and Korea’s traditional dance and music. Those who attended Sunday’s concert included Lt. Gen. Michael A. 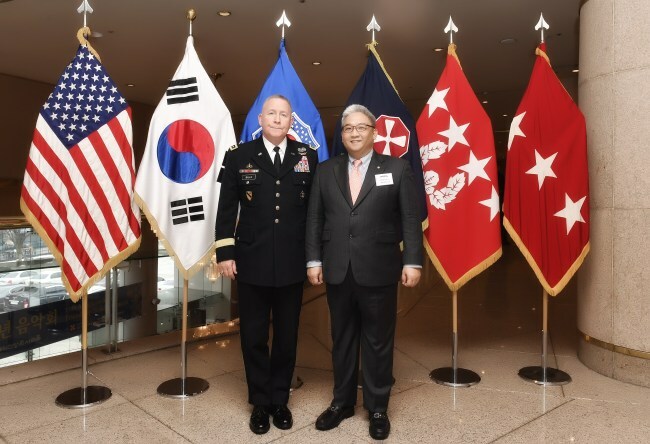 Bills, Eighth Army commanding general, US Ambassador Harry Harris and Gen. Kim Byung-joo, deputy commander of the Combined Forces Command. A total of 2,000 military personnel and their family members from both the US and Korean militaries also attended the concert. The Eighth Army Band -- a century-old band comprising some 50 musicians -- performed a Christmas repertoire during the first half of the concert, including “Christmas Eve/Sarajevo 12/24.” Treg Ancelet, Eighth Army band conductor, led the band. After the intermission, traditional Korean dance company Kook Soo-ho Didim Dance Company performed traditional music and dance, including an excerpt from “Heungboga” by master pansori singer Ahn Sook-sun. Traditional music group TAGO also performed a drum dance. “This year marks the 11th year since Seoul Cyber University started to hold the joint year-end concert. It is quite meaningful,” Seoul Cyber University President Lee Eun-joo said. “I am also very happy to see the concert has taken root as a celebration of the ties between the two countries and also something that soldiers and their families can enjoy,” Lee added.